Most people take precautions to protect their skin from harmful sunlight damage but few are as aware of the permanent and accumulative damage of sun exposure to your eyes. Unlike other parts of your body, the lens in your eyes does not have the capacity to repair itself once damaged. In time, the damage to the lens caused by sunlight may lead to serious eye diseases or eventually to loss or impairment of vision. 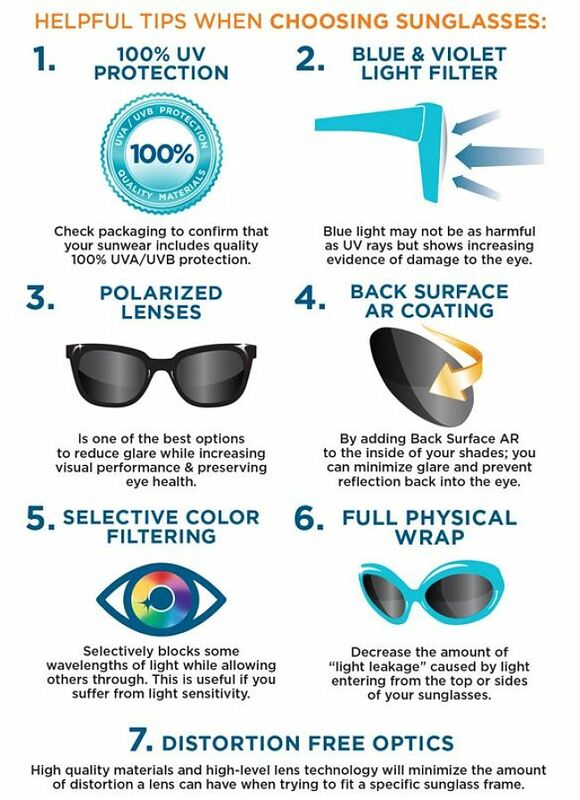 Both UV rays and the light at the blue end of the spectrum can damage your eyes. One of the problems is that there are so many myths and misunderstandings about sun damage and this means that many people are unaware of the dangers or become aware too late after the damage is done and is irreversible. For example, most people are unaware that blue light rays and UV can damage your eyes on cloudy days and even completely overcast days. Likewise sunglasses have become a fashion accessory rather than a genuine protective device. One of the problems with sunscreens is that for many years there was a positive relationship between sunscreen use and skin cancer incidence. Despite all the tests that had been done the conclusion was that sunscreen used caused cancer or increased the risk of cancer. Why did this occur? There were two reasons: Many sunscreens were simply ineffective and some of the earliest active ingredients were shown to be carcinogens. The other reason that many people applied a single sunscreen coating and went out in the sun through the hottest part of the part around noon. Many did not reapply the sunscreens after swimming or after several hours of exposure. They had been lulled into a false sense of security and went out in the most dangerous part of the day without adequate cover. In a similar way many people may be using poor quality eye-protection during the worst time of the day and not taking adequate precautions when its not sunny. While the damaging effects of the suns rays are three times greater during summer than winter, people can still be at risk of serious eye damage if they do not avoid going out in the sun, two hours before and after noon, during the winter months without properly certified eye protection. Cataracts - are a type of eye damage associated with the lens of the eye becoming cloudy and losing its transparency. Cataracts can eventually cause blindness. Research has shown that UV radiation increases the risk of certain types of cataracts. Cataracts can be cured with modern eye surgery. 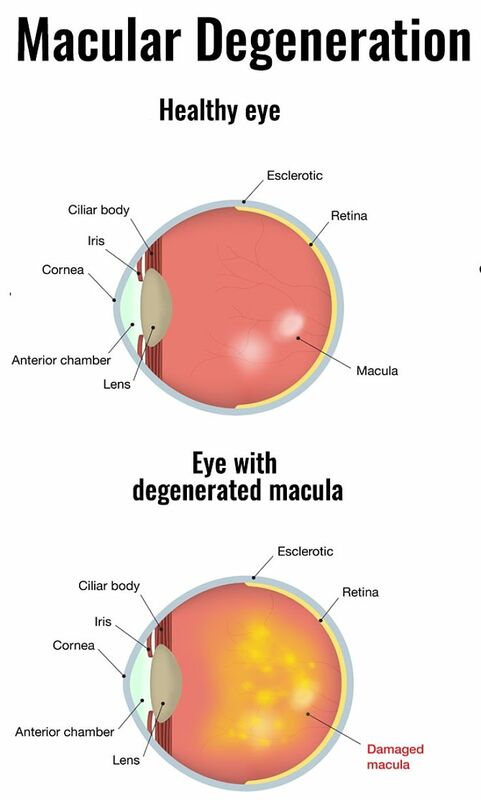 Age-related macular degeneration - is the physical deterioration of the core of the retina called the 'macula', which is about the size of a small pea. This central part of the retina is crucial for detailed vision such as driving, reading, watching television, recognizing faces, and other fine close-up work. Research has shown that macular degeneration is the most frequent cause of legal blindness in people over age 55. It occurs more commonly in women, especially those with lighter colored eyes. About 30% of adults over 75 years of age have been found to show early signs of macular degeneration. This increases to 50% by the age of 80 years. 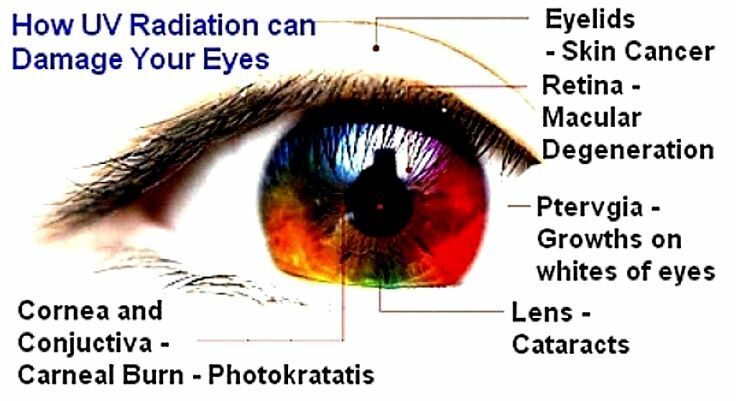 The likely cause of macular degeneration like that of the lens are "free radicals" with bright sunlight and ultraviolet light contributing to the formation of free radicals that damage the macula. Diet, hereditary and lifestyle factors affect the generation of these free radicals and the damage they cause. Diseases such as atherosclerosis and diabetes may accelerate the process. Pterygia (Surfers's Eye) - are benign tissue growths on the whites (conjunctiva) of the eyes usually on the side closest to the nose. These growths are thought to be caused by UV-light exposure, wind, sand, dust and low humidity, and dust. Photokeratitis - is sunburn of the cornea caused by UV exposure, including sunlight. Effectively the cornea of the eye gets burned. There are various forms of photokeratitis that include snow blindness, arc eye and Welder's Flash. The condition is temporary and reversible. It often occurs at high altitudes where there is highly reflective snow. What Is a Pinguecula and a Pterygium (Surfer's Eye)? 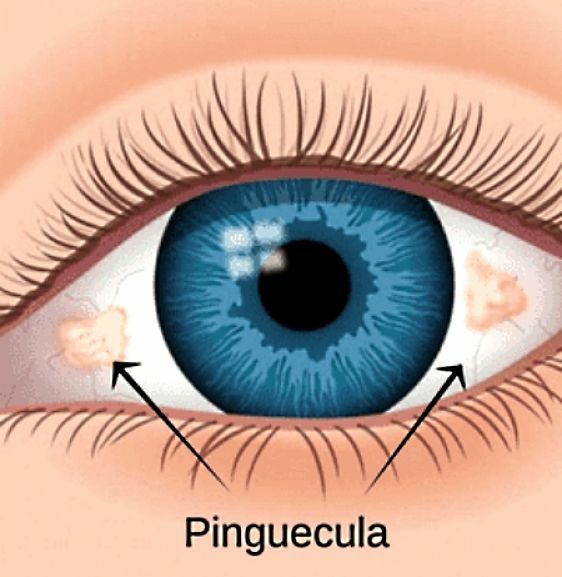 Pinguecula and pterygium are growths induced by sun damage on your eye’s conjunctiva, which is the clear covering over the white part of the eye. Pinguecula is a growth that looks like a yellow spot or bump on the conjunctiva. It often appears on the side of the eye near your nose. A pinguecula is a deposit of protein, fat, or calcium. 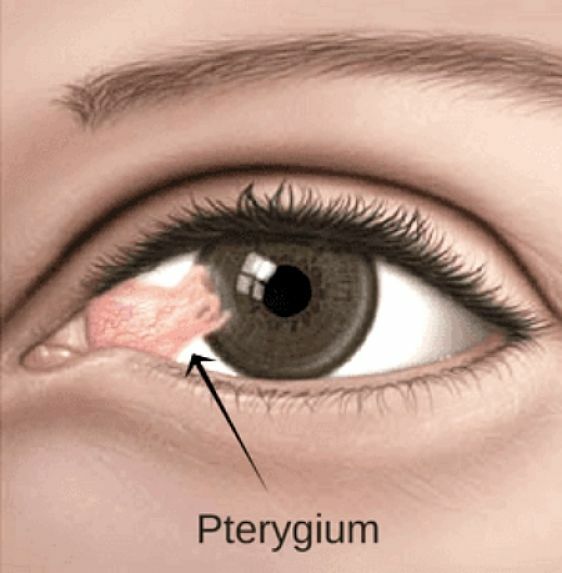 Pterygium is a growth of fleshy tissue that may start as a pinguecula. It can remain small or grow large enough to cover part of the cornea. When this happens, it can affect your vision. The most effective way to shield your eyes from UV exposure is to wear protective sunglasses. Properly certified sunglasses should be worn whenever you go outside (even briefly). UV rays are most intense and at risk of damaging your eyes during the early afternoon, during summer, near water and at beaches, where sunlight is reflected, and at high altitudes. Studies have shown that the main danger period is between 10 AM and 4 PM daily, so it is particularly important to provide protection for your eyes during this period and where possible, avoid going out in the sun during the middle of the day. But damage can occur even on cloudy days and in the early morning and late afternoon. Wearing protective sunglasses with side shields as well as a wide brimmed hats is also important. The type of sunglasses you choose is also important as the various types available vary greatly in the protection they provide. Choose a pair of sunglasses that are labelled to show that they are certified 9 or 10 grade and so can provide protection from virtually 100% of both UVB and UVA type UV rays. The sunglasses you buy should also be effective in filtering as much visible light as possible (especially blue light), and try to buy glasses from reputable manufacturers. Excessive exposure to UV rays during early childhood years is particularly harmful to your eyes, possibly only showing up later in life. Certain drugs can make your eyes and skin, more sensitive to light damage. This sensitivity to sunlight means your eyes are more prone to sun-related damage. Sunlight is at its most intense between the hours of 10 in the morning to 2 in the afternoon. 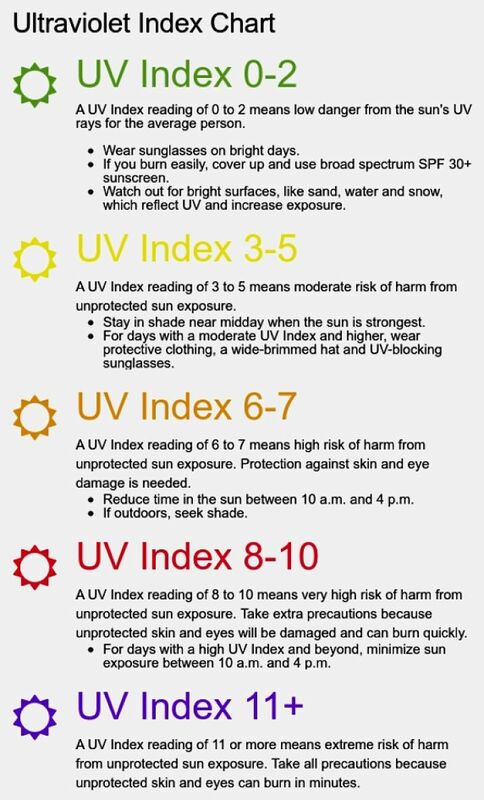 Between these hours, there is high risk of ultraviolet exposure. Temperature does not give any indication of UV intensity. UV intensity can even be high in winter in alpine regions due to factors such as altitude and reflected light from snow. Just like the skin, lighter eye colors provide more protection against the sun than darker eye colours. But in either case, sunglasses with proper UV protection are important for everyone. Beware that cloud cover does not necessarily provide much protection from UV rays, and in some cases may actually increase the level of UV radiation - as some types of cloud cover may reflect light. UV-rays are significantly more concentrated and intense in areas of high reflected light, such as high altitudes, snow-covered mountains, reflective bodies of water (lakes, rivers, and the sea) and sandy beaches. If you're a fair-haired, light-eyed, a smoking Caucasian female, you're in the high-risk category for sun damage to the eyes. But really, damage can occur to everyone. Wear a hat with a wide brim to block out sunlight from overhead. Children need to wear sunglasses - and not toy sunglasses. Like your skin, most of the sun damage to your eyes is accrued in a person's early developmental years. So sun protection is vital for young people. Diet is important for healthy eyes and lutein, which is a carotenoid that is thought to function as an antioxidant and may offer protection from free radical damage. => Do the Eyes Tell Someone is Lying or is Lying Eyes a Myth?